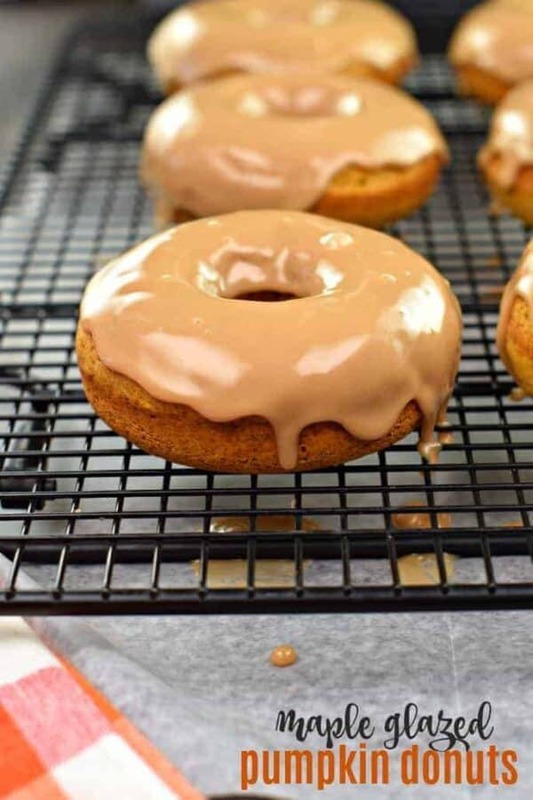 Soft pumpkin donuts topped with a maple glaze are exactly how I want to celebrate a fall morning. 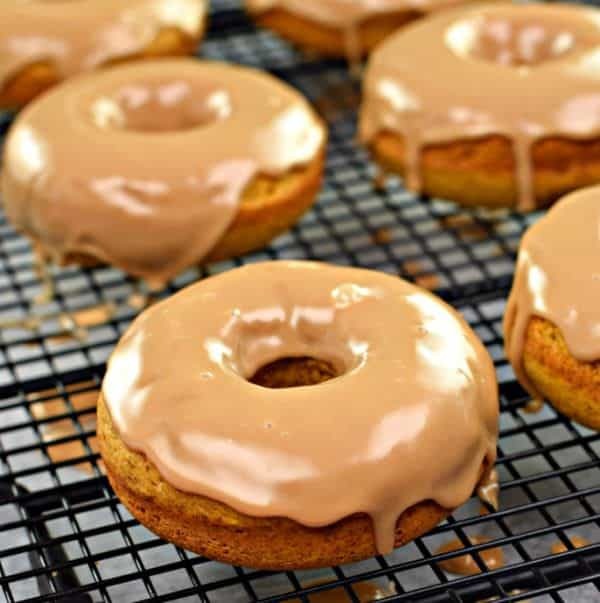 Bake a batch of Maple Glazed Pumpkin Donuts today! Hi, my name is Aimee, and I have an obsession with pumpkin. It’s true. And while I have many people who follow me on facebook cringing at all the pumpkin recipes I share, I can’t help myself. Every recipe is amazing. I big, fat, puffy heart, scented sticker LOVE pumpkin (dramatic much?) If it were socially acceptable to share pumpkin recipes all year long, I totally would. I also love the maple pumpkin combination. I’ve used it several times! Like in this Pumpkin Streusel Coffee Cake or these Pumpkin Hand Pies with Maple Glaze. The flavor profile is truly irresistible in my opinion. However, I’m married to an anti-pumpkin person. He hates all things pumpkin. 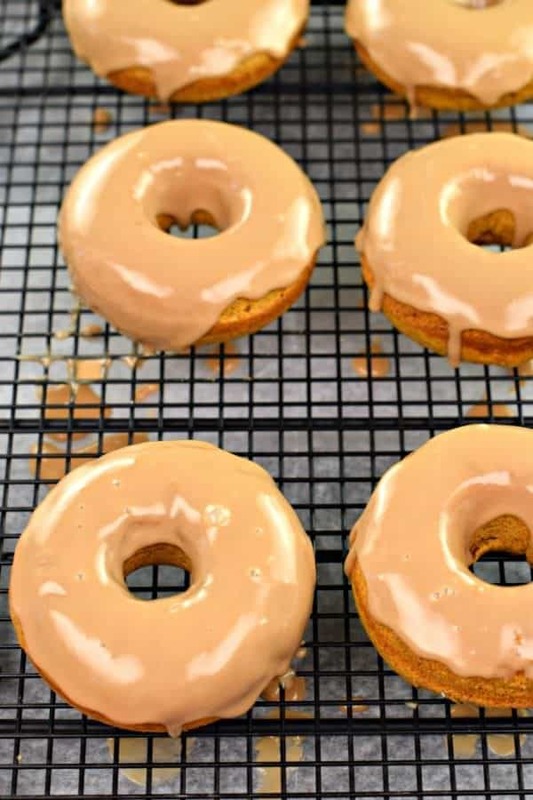 So when my girls had a sleepover last week with a few of their friends, I knew I wanted to bake up a DOUBLE batch of these Maple Glazed Pumpkin Donuts. It was a win-win. We all enjoyed the delicious donuts, and my husband wasn’t pressured to eat one or shamed for refusing them, haha! Whisk your glaze in a shallow bowl. 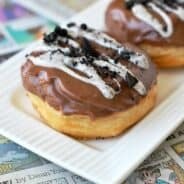 Dunk the top of the donut, then carefully pull it out and place it on a wire rack to allow glaze to set. That will only take a few minutes! I let my donuts cool completely, otherwise the glaze will get runny. Which, is not a horrible thing, it will just be lighter and runnier (much more like a krispy kreme glaze donuts). The drawback to a warm donut though is it could fall apart as you dunk it. So be careful. Make a double batch. Seriously. You know you want to. You can freeze these donuts (without the glaze)…but I suggest you just eat them. Immediately. Wipe the glaze off your chin and resume eating your healthy Spinach Salad. I won’t tell. Bake in 375 degree oven for about 13-15 minutes. Remove from oven and cool in pan for about 5 minutes, then remove from pan and cool completely on wire rack. Once cooled, whisk together the glaze ingredients until smooth. Dunk cooled donuts into glaze and place back on wire rack. Allow to set about 5 minutes and enjoy! I love this Pumpkin Pecan Bread from Inside BruCrew Life. That crunchy topping stole my heart! My family has chosen this Pumpkin Magic Cake as our Thanksgiving dessert. Move over pumpkin pie (shocking right???)! Grab and go breakfast foods are a must in my busy family. These Pumpkin Oat Breakfast Cookies from A Dash of Sanity look amazing! Need something a little healthier in your life? How about my Pumpkin Pie Smoothie recipe? Whip up a delicious fall breakfast with these Whole Wheat Pumpkin Waffles from Bless this Mess! 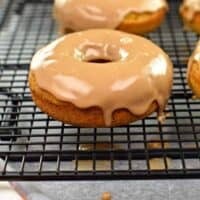 Swooning over the maple glaze! 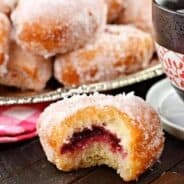 My family will devour these donuts! Love love love that these are baked not fried and also, you add more pumpkin than some of the other recipes i have seen! 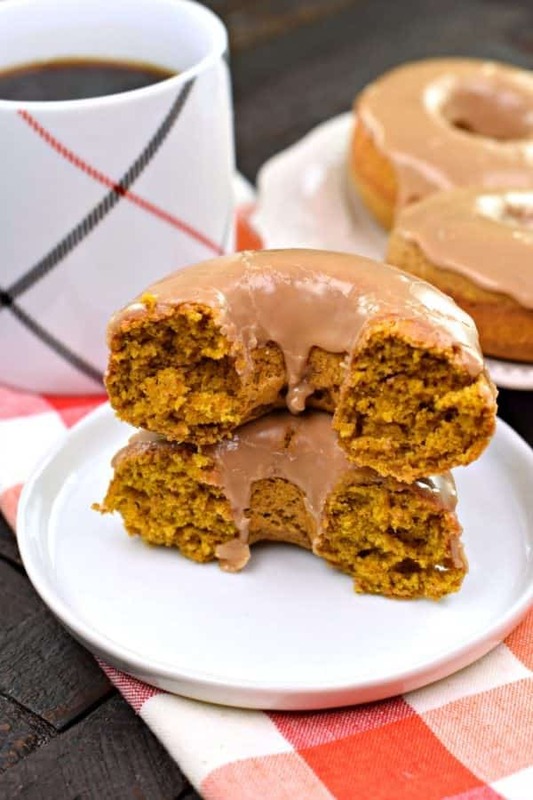 I think this is a GREAT thing because I love the pumpkin flavor and also, sometimes baked donuts can fall a bit flat in the moisture and flavor department. But these look so so perfect and tasty!! Instead of adding in the cloves , cinnamon , and other spices , is there a measurement of pumpkin pie spice I could use instead ? 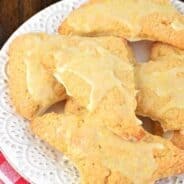 If I’m using maple syrup instead of extract would I use more or less? Maple Syrup isn’t as concentrated as extract so you would lose a lot of the flavor you’re looking for! I made this glaze and it looks white. Not brown like in your picture. Did you add food coloring? I did not. However, I have found out from other readers that some brands of maple extract are colored and some are not, which changes the color of the glaze.